Ever dream of being a guidebook author and wonder what it takes? 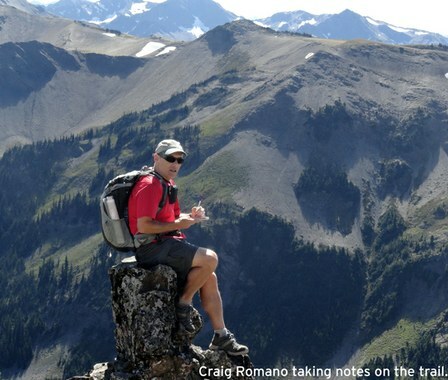 Here's your chance to learn from a successful author and coauthor of over a dozen guidebooks. The truth is I love my job. But it’s no walk in the park. I don’t just hike. I work — and I work hard, putting in more time behind the computer and on the road promoting my work than on the trail. I work hard to make my guidebooks the best out there. Writing is a passion, not a job. As a writer, I am both blessed and cursed. I am blessed that I have developed my craft and am able to communicate well on paper. I am blessed in that I have an inquisitive nature — a passion to learn — and a desire to share what I learn with others. I am cursed in that I must write — it is what I was meant to do. I will never be happy doing anything else. Trust me I tried. Know thyself. I tried suppressing the urge to write in the past — but it’s impossible to ignore a calling. Many of my would-be-job-usurpers — after declaring they want my job — point out they love to hike, and hike a lot. Okay. I love to eat and eat a lot, but that doesn’t make me a chef! You have to know how to write, and in this age of texting, and finger sliding across tiny screens, I dare say that people who know how to write well are becoming as rare as moderate politicians. Writing good guidebooks requires technical writing skills, creative writing skills, good interviewing skills — and it doesn’t hurt to have a background in natural history, cultural history, and regional history as well. With the standards I laid out below in my Little Guide to Writing Guidebooks, I set out to create the best guidebook possible. First, I asses the marketplace. While I absolutely love hiking Mount St Helens, for instance (the topic of my newest guidebook), is there a demand for a new book on it? What is currently out there? What can I do better than what is out there? Once I determine there is indeed a marketplace for such a book, I then decide what to include in it. How large of a geographical area and how many trails will it include? I try to make my books as comprehensive as possible. I research the area thoroughly and then head out for the best part of my job — the on the trail research. Typically I spend most of May through October on the trail, and the rest of the year on the computer and promoting. After I complete the manuscript, I do some fact checking, confirming with land agencies, conservation groups and trail organizations. Then I send the manuscript off to my editor for a very thorough and drawn-out editing process. The manuscript goes back forth between us. My project manager is involved too, giving it several reads. We go through all of the maps, making sure there are no discrepancies and they are consistent with the text. It is a laborious process and my least favorite aspect of my job — but it’s one of the most important. Once we’ve gone over and over the book, and made it the best possible, it’s sent to the printers. Receiving my first copy of the book is akin to seeing your child for the first time. The “pregnancy” (process) was long with its joys and frustrations and the “labor” (editing) was difficult. But once you see the shining cover of your brand new book, it’s all worth it! And, like a new parent, you want to tell the whole world about your bundle of words. That’s when the next stage begins. I fill my calendar with book talks and travel throughout the state and beyond sharing my excitement and enthusiasm for my book — and most importantly the topic of my book. I love getting people excited to hit the trail. That is the most rewarding part of my job. But even after I’ve done countless talks, interviews, and appearances, the work is not done. My book needs to stay relevant — especially in this digital age. My publisher keeps the printings fairly low so that with each subsequent printing, I can make minor edits to reflect any changes that may occur on the trail. So I must constantly stay up to date with what is going on out there. When it’s time to do a second edition — which I currently am doing with my Day Hiking Olympic Peninsula book — I begin the process all over again. Yes I am re-hiking every trail again and hiking many others — new trails that’ll be making it into this edition. I can’t wait to share this information with you. And wouldn’t you rather be reading my guidebooks than writing them?